NUREMBERG, Germany--(BUSINESS WIRE)-- EMBEDDED WORLD — Cypress Semiconductor Corp. (NASDAQ:CY), the leader in advanced embedded solutions, today announced a new serial nonvolatile memory family that offers superior performance and reliability for mission-critical data capture. The Excelon™ Ferroelectric Random Access Memory (F-RAM™) family delivers high-speed nonvolatile data logging, preventing data-loss even in harsh automotive and industrial operating environments over extreme temperatures. The Excelon Auto series offers 2-Mb to 4-Mb automotive-grade densities, while the Excelon Ultra series offers 4-Mb to 8-Mb industrial-grade densities. Both families are available in low pin count small package options making them ideal for a broad range of advanced automotive and industrial applications. The Excelon Auto series is offered in AEC-Q100 extended temperature options with functional safety (ISO 26262) compliance. The Excelon Ultra series offers 108-MHz Quad Serial Peripheral Interface (SPI) performance, which outperforms legacy memories. The Excelon family's inherent NoDelayTM instant writes also eliminate power failure "data-at-risk" due to volatile data buffers in legacy technologies and is offered in reduced pin count QFN packages. The family features wide voltage operation from 1.71V to 3.6V and is available in RoHS-compliant industry-standard packages that are pin compatible with EEPROMs and other nonvolatile memories. All Cypress F-RAMs provide 100-trillion (1014) read/write cycle endurance with 10 years of data retention at 85° C or 151 years at 65° C. More information about Cypress' F-RAM portfolio is available at www.cypress.com/fram. "The ability to instantly capture the last event data in automotive data recorders is a game-changer in crash forensics, especially with the increased deployment of semi- and fully-autonomous vehicles," said Sam Geha, corporate executive vice president of the Memory Products Division at Cypress. "Additionally, Industry 4.0 deployments require high speed, high-reliability data-logging to ensure system up-time while improving efficiencies. Failure is not an option when dealing with data this valuable and mission-critical. 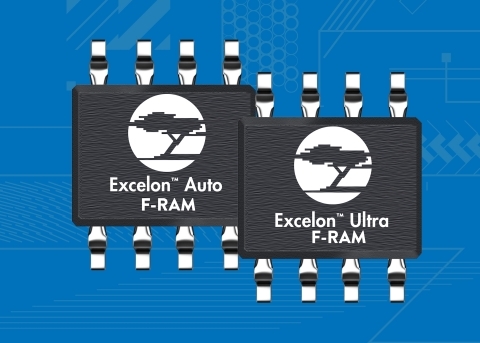 Our new Excelon F-RAM devices outperform competing nonvolatile memories with instant nonvolatility, high speed, high endurance and low power modes, making them the ideal choice to capture and protect the most critical data in advanced factory automation and industrial IoT systems." Cypress is demonstrating its Excelon F-RAMs, along with its complete embedded systems solution portfolio, at the Embedded World trade show in hall 4A, stand 148 of the Nuremberg Exhibition Center from February 27 to March 1. Cypress' Excelon F-RAM devices are currently sampling with production expected in the third quarter of 2018. Cypress offers a broad portfolio of F-RAM products with densities from 4-Kb to 8-Mb and supply voltages from 1.8V to 5.5V. Cypress F-RAMs feature virtually unlimited endurance of one-hundred trillion (10^14) read and write cycles, making them an ideal solution for write-intensive applications. F-RAM is the industry's most energy efficient nonvolatile RAM solution; the F-RAM cell is inherently low power and operates without a charge pump. Cypress F-RAM is an ideal solution for applications requiring high-performance, high-reliability, low-cost nonvolatile memory solutions, including automotive, industrial, computing, networking, smart meter, and multifunction printer applications. More information about Cypress' portfolio of F-RAM products is available at www.cypress.com/nonvolatile. Cypress and the Cypress logo are registered trademarks and F-RAM, Excelon and NoDelay are trademarks of Cypress Semiconductor Corp. All other trademarks are property of their owners.